[Update] Samsung has officially announced in a press conference that it will halt the sales of the Note 7 and “will prepare replacement devices for phones already sold after finding problems with the battery cell used”. 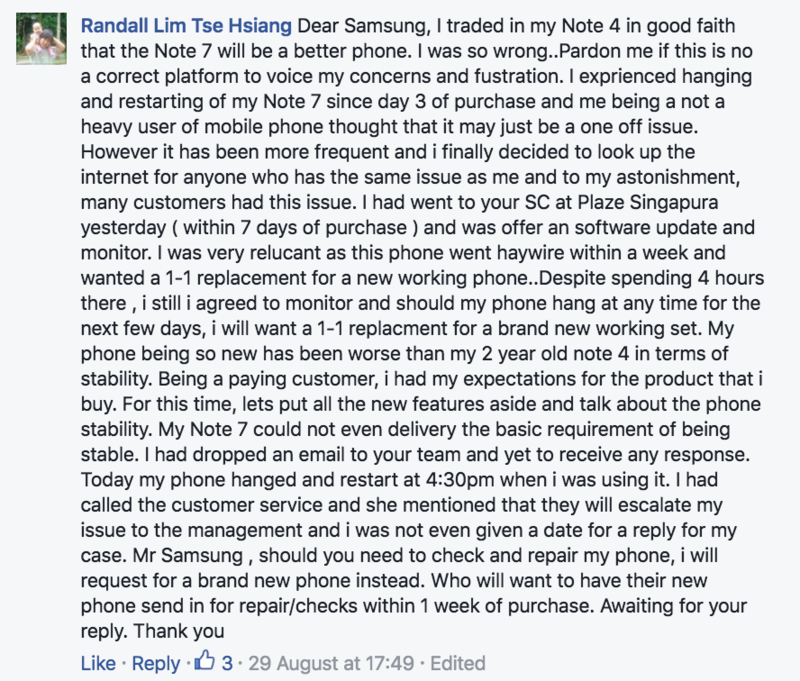 Local telcos Singtel, M1 and Starhub have taken the device off their shelves following the announcement. 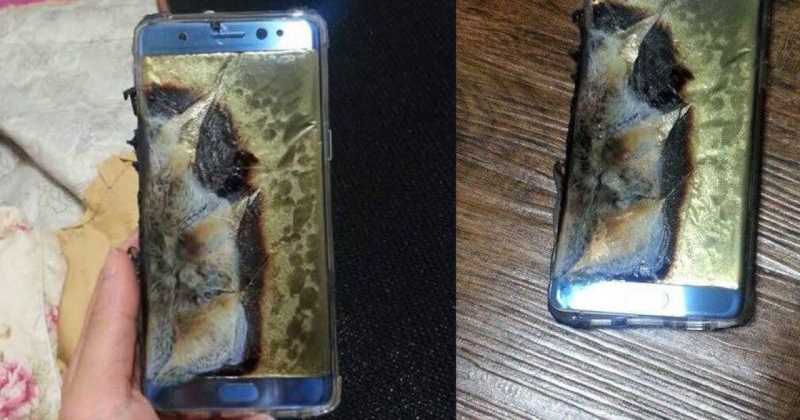 According to Yonhap News Agency, Samsung is expected to announce a recall of its newest offering, Galaxy Note 7, after reports that the devices are exploding while being charged. Investigations are reportedly underway, and the results are expected to be announced either this weekend, or early next week. There’s an emphasis that consumers will be at the forefront of the company’s considerations, and the final decision of what further actions would be taken are “made in considerations of maximum consumer benefit”. This comes as the first time that a recall might been issued. Samsung began selling their latest phablet (phone + tablet) Galaxy Note 7 on 19 August in 10 countries worldwide, Singapore included. However, the phablet’s release to eager fans was reportedly marred by frozen screens and random reboots at the opening screen. 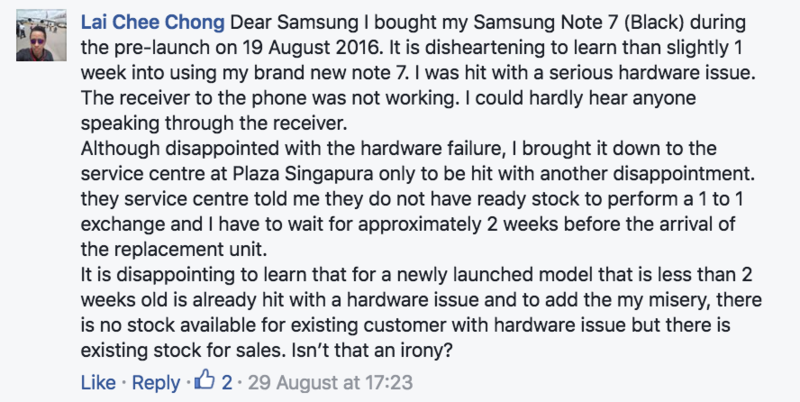 Upon checking, we realised that many had also taken to Samsung Mobile Singapore’s Facebook page to air their grievances. With today’s report from Channel NewsAsia spreading rapidly on Singaporean news feeds, a netizen has taken to the company’s Facebook page again, in hopes of getting an official response locally. 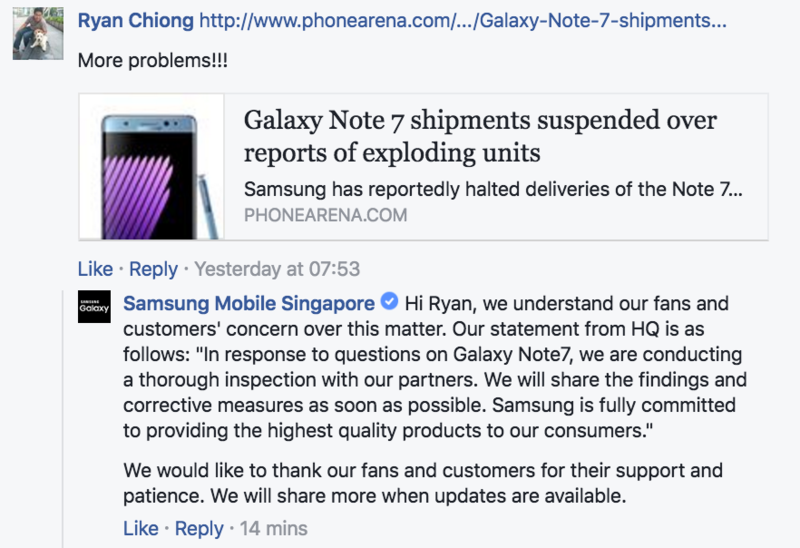 The news is still developing and it’s hard to tell if there’s a need for all to shun their shiny new Note 7s, but just to be safe (and kiasi a bit), we’d advice you to use your previous phones till the results are out.